The first offices can probably be traced back thousands of years to the ancient world where civilizations administered to the needs of their citizens, organized and stored growing quantities of information, and managed the daily operations of their municipalities. Many ancient civilizations had significant population centers that were hubs of political, military, and administrative infrastructures which must have been managed by sizable bureaucracies. In the middle ages, the concept of the office as a workplace was best represented by the chancery, which was responsible for the writing of official documents. Churches, monasteries, kingdoms, and regional city-states required centralized workplaces to manage the production of these documents and the keeping of records. These medieval offices housed notaries, secretaries, and clerks that produced charters, writs, laws, and tax records. For hundreds of years until the exploration of the New World, much of the population was involved in farming, the manual trades, and craft guilds. With the rise of colonialism, global trade, and mercantilism, the need arose to administer to new governmental and economic organizations, such as The Bank of England and The East India Company. These organizations had the first purpose-built office buildings to house their administrative employees and manage the paperwork of running a business. The rise of industrialism, urbanization, and world trade in the 18th and 19th centuries brought about a sea change in the development of the workplace. Factories, mills, railroads, banking, oil, shipping, and insurance companies needed an increasing amount of space to house operations, executive offices, and clerks. Technology played a major role in the development of office spaces. At the end of the 19th century, the invention of the light bulb, typewriter, dictaphone, and telephone changed how the workplace functioned. The first steel framed office towers with elevators were constructed providing multi-floor offices. However, what was happening within these buildings with regard to office design was anything but inventive. Taylorism, a scientific method of production management used for maximizing the efficiency of machines and workers espoused by industrial engineer Frederick Taylor, was universally applied to office layouts. 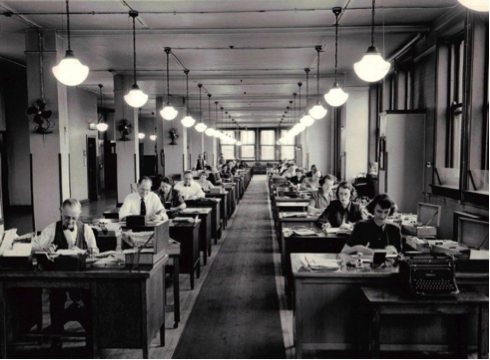 Linear rows of desks were packed tightly to maximize efficiency and overseen by management in private offices. Little regard was given to ergonomics, acoustics, or comfort. Frank Lloyd Wright designed some of the first modern open office environments with custom office furniture as early as 1904 in the Larkin Building in Buffalo, NY and later for Johnson Wax in Racine, WI in 1939. Although the buildings themselves were innovative, very little changed in the rigid hierarchical and regimented rational behind the office layouts that remained the norm throughout the early part of the 20th century. However, as construction technology evolved, the design of offices adapted to more generous column spacing, fluorescent lighting, electrical and telecommunications distribution, and air conditioning. The post WWII era ushered in a new emphasis on social democratic values and a more egalitarian management approach through the influence of principles called Bürolandschaft (office landscape) promoted by the German design group Quickborner. The idea was to foster a more interactive workspace with a more organic layout than endless rows of desks. Workstations would be grouped based on need and separated from each other by plants and file cabinets. Around the same time, Robert Propst, under the direction of George Nelson at Herman Miller research, was evaluating modern office design in the 60’s. Propst consulted with behavioral psychologists, anthropologists, and mathematicians at Michigan State University. His research led to the conclusion that the open office environment actually impeded communication and negatively affected worker performance. The solution Propst conceived and George Nelson executed was called Action Office. This is the first modular, panelized, contract furniture system. The system was designed to give workers heads down privacy when needed. The flexible, semi-enclosed design consisted of 120 degree angled panels that also allowed communication with colleagues. However, the system was better suited for professional offices and subsequently Action Office II was developed to appeal to a wider range of companies. This system, commonly referred to as a cubicle, gave rise to the cubicle farm which dominated office design through the 70’s and 80’s. Corporations reaped the benefits of a cheap, modular design that maximized square footage and saved on real estate costs. Although widely popular and co-opted by other furniture manufacturers, the cubicle was derided for its dehumanizing effect and its deleterious impact on collaboration. Along with the rise of computers tethering workers to their desks and widespread adoption of email, workers now connected virtually instead of interacting face to face. The office was becoming less of a collaborative work environment and more cloistered. In the 90’s, the dot com boom in Silicon Valley brought about a new workplace style that borrowed from the collaborative and social nature of college life and the hacker culture. Conforming to the suburban office typology prevalent in the Silicon Valley, tech companies competed for new young talent with amenities such as foosball, pool, and ping pong tables. The campus approach became the calling card of these unconventional office environments. While many of these early dot coms went bust, a company culture of social interaction became a popular concept for new corporate offices. New design concepts, such as touchdown spaces, cubbies, hot desking, and hoteling, also started to emerge in more traditional companies with employees that are not in the office full time. These trends also had the intended consequences of saving on real estate costs, which were soaring. In fact, studies have shown the average square footage per worker has dropped from about 500 sf in the 1970’s to about 150 sf in 2017, and the trend is still going lower. Bolstered by the advances in telecommunications, the internet, and faster computers, many workers became more mobile. Work could now occur at home, in a coffee shop, or in different parts of the office. Eschewing bland, confining cubicles, corporate work styles saw a change back to the open office environment of earlier eras with benching systems and open meeting areas. However, there has been a backlash against purely open environments due to the detrimental effects of noise on concentration and decreased productivity. 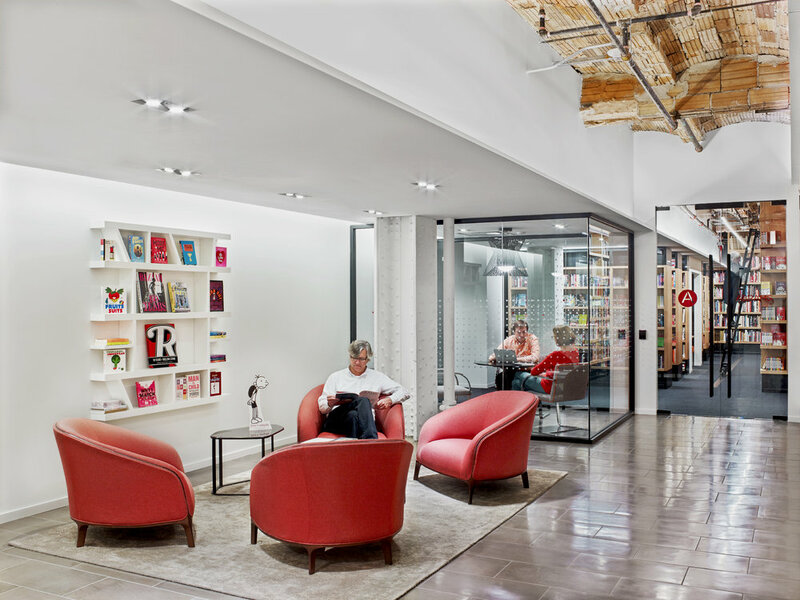 Current design trends include providing varying work environments, such as open collaborative areas and private spaces, to meet the needs of varying work modes, and to accommodate generational differences of the Baby Boomers, Gen X, Gen Y, and Millennials who are all in the workforce at the same time. Current office design trends include informal communal spaces, focused work areas, and collaborative meeting spaces. Sustainable design, biophilic design, and wellness initiatives, such as adjustable desking and circadian lighting, are all components of successful workplace strategy. Co-working, activity based workplace (ABW), data driven design, adaptable workspaces, and physical and psychological wellness are driving the evolution of the workplace ecosystem. What will the future bring? Judging from the past, future office design will most certainly be influenced by technology, but the needs for human social interaction will always be a principal factor in any successful office design.